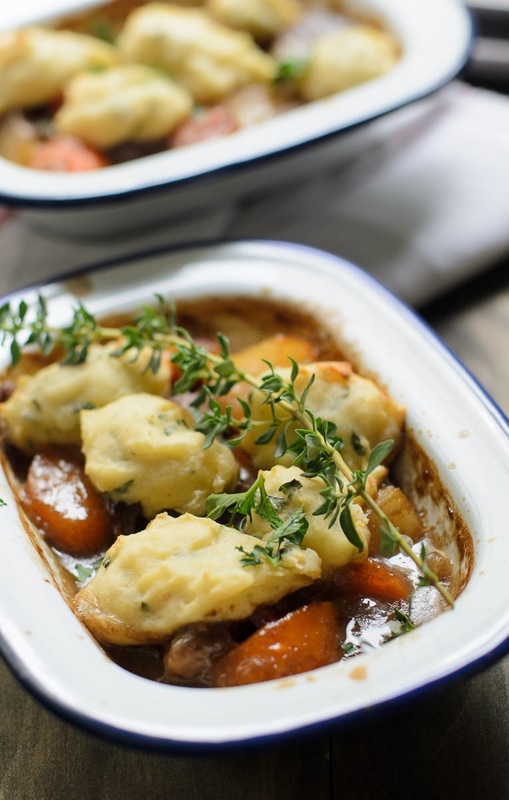 Delicious and easy recipe of braised beef and horseradish dumplings. Comfort food for cooler weather. Which part of entire cooking process, from beginning to end, do you like best? and why? My preference would be : Food prep, follow by cleaning then cooking. Food preparation comes first, as I basically must know what I wanted to eat for the day and starts preparing the ingredients earlier, eg like buying, thawing and down to detail of how to cut my vegetables or meat. Cleaning... I cannot tolerate messy kitchen. Its funny though... both of us can't stand messy kitchen and yet, when it comes to cooking, he is the messier one!! Bottle of sauces, bags of spices and he almost 'emptied' (of course.. I must exaggerate!) the drawers of utensils, pots and pans :P.
Cooking... and it depends on what type of food we are having. Elaborate Asian cooking will be his forte. Beef rendang, Daging Masak Hitam / Beef Curry in Sweet Soy Sauce and Butter Chicken on this blog were cooked by hubby, photographed by me :P.
I am all for less work, less mess and less time sweating over the stove :P.
Hence this Braised Beef with Horseradish Dumplings, is my kind of cooking. 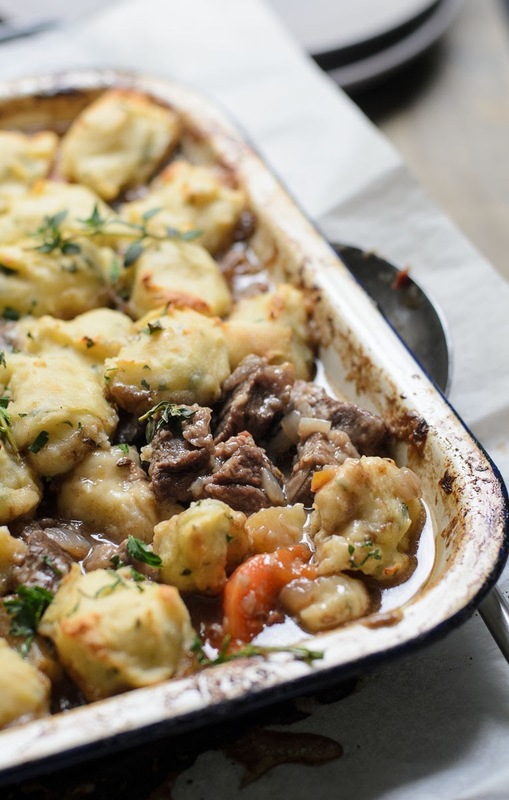 This Braised Beef with Horseradish Dumplings, can be categorised as one pot meal, if I were to use a skillet or any ovenproof vessel. However, I must showcase my enamel bakeware that I bought from Aldi, cost me less than the branded enamel sold in either Woollies/ Coles or kitchen household shops. 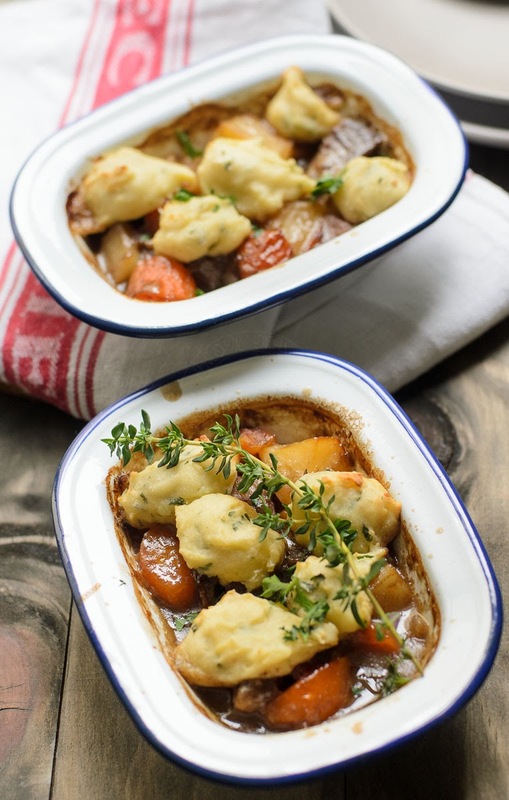 From original recipe featured in Good food Australia, I adapted this Braised Beef with Horseradish Dumplings recipe to suit our tastebud. I am sure, my family are not ready to have green apples on their dinner plate. If you are to cook this Braised Beef with Horseradish Dumplings, do buy gravy beef, it made a lot of difference than ordinary steak. The meat pieces are juicy, moist and tender. 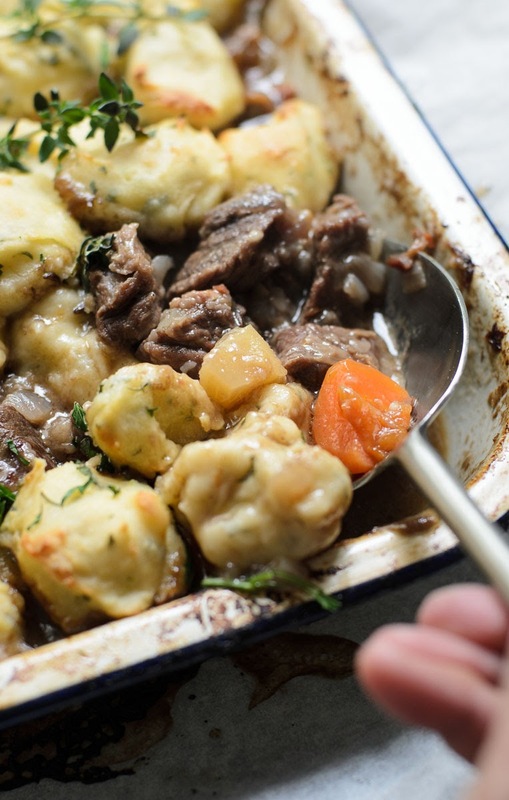 One pot meal of braised beef with potato and horseradish dumplings. 2 cubes beef style stock. Place potato in a medium size pot or large enough to accomodate 400 g potatoes. Add water to just cover the potatoes. Add salt and bring to boil for 7-8 minutes or until potatoes are tender. Strain and leave it cool slightly. Sieve plain flour and baking powder. Add the rest of the ingredients and mash until smooth and comes together. Toss beef and flour in a ziplock plastic bag to coat. Shake off excess. Heat 1 tablespoon olive oil on a pot. Saute onion and caraway seeds until onion has soften. Remove to heat proof bowl. Heat another tablespoon oil on medium heat. Add halved the beef. Turn every often until browned all over. Transfer to onion -caraway seeds mixture. Repeat with the other halved of the beef. Return the beef-onion-caraway seeds mix into the pot. Uncover and spoon potato-horseradish mixture onto the the braised beef. Uncover and cook for another 20 minutes or until dumplings are cooked. Garnish with parsley or thyme and serve.